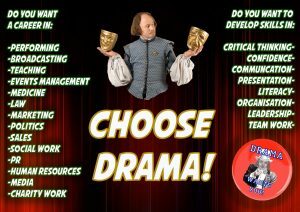 Welcome to Drama we provide courses for all learners at all stages. We offer the Curriculum for Excellence Broad General Education from S1-S3. In the Senior Phase we offer National 5 in S4 and Higher and Advanced Higher to S5 & S6. Each page gives a more detailed breakdown of the course and each pupil in the subject is encouraged to use Google Classroom to access resources and coursework.